The WTN or win to nil is one of the most lucrative outright result markets in football betting. However, it is also one of the more difficult markets to corner. For your bet to be successful, the team you select to win a particular fixture must emerge victorious with a clean sheet (i.e. 1-0, 2-0, 3-0 etc). That might sound like a relatively simple task, but it’s notoriously tricky to identify teams that win to nil on a regular basis. That level of difficulty is often reflected in the odds made available for a WTN selection by bookmakers. PSG play Toulouse in Paris on Saturday, in what looks like being the most one-sided fixture in France this weekend. The odds on PSG to win their Ligue 1 clash outright are around 1/9, though their odds to win the game to nil are a much closer 8/11. At first glance, those WTN odds look extremely enticing, however, a look at the fixture’s supporting statistics helps to highlight why win to nil can be such a bumpy market to navigate. Paris St. Germain have been utterly dominant in Ligue 1 this season, winning 13 out of 13 league fixtures since the new season kicked off in August. The Parisians have averaged an eye-watering 3.46 goals per 90 minutes this term, however they have won to nil in just 54% of those 13 Ligue 1 games. The French champions have won 24 of their 26 Ligue 1 matches at the Parc de Princes since the start of the 2017/18 season, yet just 50% of those wins came with a clean sheet. In England, Manchester City look destined to batter their way to another Premier League title, having smashed multiple records in their successful campaign last season. Pep Guardiola’s slick side are unbeaten after 12 Premier League fixtures, picking up 32 points from the 36 available so far. However, City have won to nil in only 50% of their games. Plenty of other pertinent examples of just how difficult teams find winning to nil are sprinkling around Europe’s other top leagues. The defensively robust Atletico Madrid have won to nil in only 42% of their La Liga fixtures this season, while a Juventus defence anchored by Giorgio Chiellini and Leonardo Bonucci have also kept a clean sheet in just 42% of their Serie games in 2018/19. Bayern Munich have been well below their usually peerless best in the Bundesliga this season, however last year they won the German title by an incredible 19 points. The Bavarians won to nil in only 44% of their league fixtures in 2017/18 however. With some of the most domestically dominant clubs in Europe winning to nil in around half their games or less, finding teams that have pushed their WTN percentages into the 60s and 70s might feel like an impossible task. However, we’ve trawled through reams of statistics and bottomless pits of data to find several teams that are ahead of the WTN curve. Dutch giants Ajax have won to nil in an incredible 75% of their Eredivisie fixtures this season, and de Godenzonen have kept 9 clean sheets in 12 league games so far in 2018/19 in total. Life is tough at the top of Dutch football however, and despite their outstanding record, Ajax trail champions PSV at the summit of the Eredivisie by 5 points. Portuguese champions FC Porto have started their title defence in style this season, winning 8 of their first 10 Primeira Liga fixtures since the summer. Dragões have won to nil in a staggering 70% of their league matches in 2018/19, a statistic that is a huge improvement on last season’s equivalent figure. In 2017/18, Porto romped to the title, winning 28 of their 34 Primeira Liga games. They won to nil in just 47% of those fixtures however. Albanian Superliga outfit Skenderbeu have won to nil in 9 of their 13 league contests this term, in fact 100% of their victories have come with clean sheets this season. Similarly, all 10 of Ukrainian title chasers Dynamo Kiev’s league victories this season were won to nil. The club from the capital have conceded only 7 goals in 15 Ukrainian Premier League fixtures in total this season. In Argentina, Racing Club lead the way in the Primera Division after 12 games, and their revitalised and reorganised defence is providing the platform for their success. Last season, 17 clubs out of 28 had better defensive records in the league than Racing Club. However in 2018/19, La Academia have conceded just 7 times in their first 12 games. All but 1 of their 9 Primera Division wins this season have come with clean sheets and Racing have won to nil in 67% of their fixtures overall. 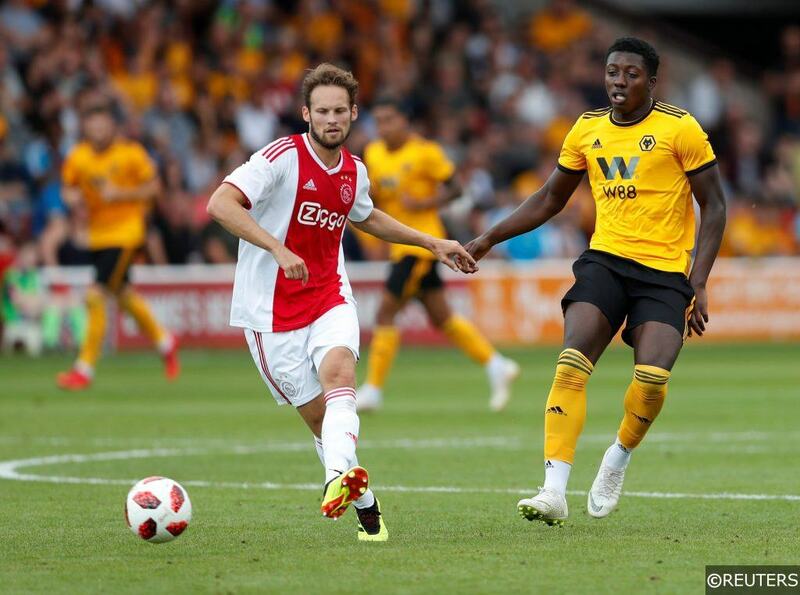 Ajax take their rock-solid defence on the road this weekend, as they travel to take on NAC Breda at the Rat Verlegh Stadion on Saturday. Struggling NAC Breda are rooted to the bottom of the Eredivisie and they have failed to scored in 42% of their league fixtures so far this season. Ajax are a ridiculous 1/8 to win the contest outright, but you can get back them to win to nil at a much healthier looking 4/5. Racing Club entertain Banfield on Monday in the Argentinean Primera Division, hoping to tighten their hold on top spot in the standings. Banfield have failed to scored in 2 of their last 3 matches and Racing are looking to keep their 5th clean sheet in 8 home games. Racing are 8/13 to win the game outright, though you can push those odds out to 11/8 if you dip your toes into the win to nil market. In Albania, Skenderbeu travel to the country’s north west to take on KF Tirana at the Selman Stërmasi Stadium. Skenderbeu take their 67% WTN record to play a Tirana side who have failed to scored in a whopping 83% of their league matches at home this season. Elsewhere, FC Porto take on Belenenses in the 4th round of the Taca de Portugal on Saturday at the Estádio do Dragão. Along with their impressive 70% win to nil rate this season, Porto have kept 5 clean sheets in their last 6 meetings with Belenenses. Categories: Betting Strategy, Blog, and Football. Tags: betting advice, betting strategy, betting tips, win to nil, and WTN. Sports: Football.